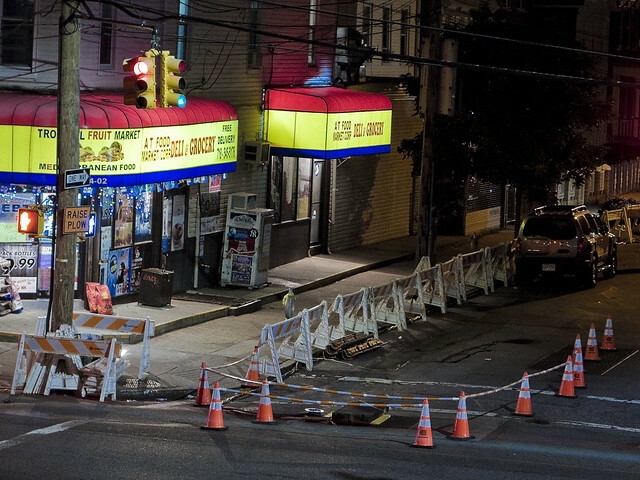 puzzling things, general weirdness, and an update on that transformer fire in Astoria. Out on the water in NY Harbor recently, the scene above was observed. Famously, one of those “harbor advocacy” statements which one is oft heard announcing on my walking and boat tours is that “maritime is the greenest way to transport cargo, with a single barge carrying the equivalent of thirty eight trucks worth of stuff,” but you seldom see it literally expressed by a barge carrying an actual truck. 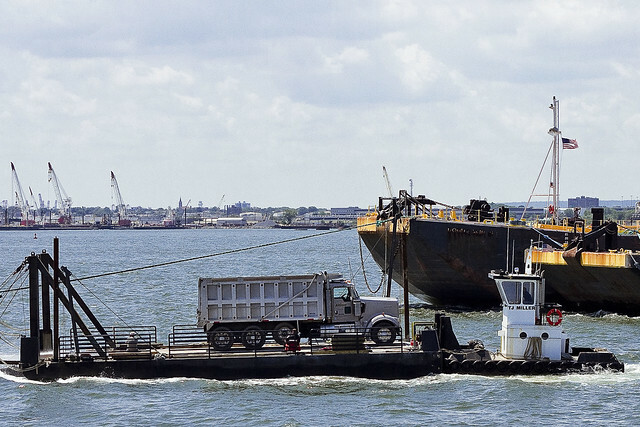 My rhetorical statement is actually built around a full sized flat top barge carrying cargo containers and guided by harbor sized tugboat type of scenario, rather than a smallish work barge that’s carrying a dump truck and being towed by a little push boat. The push boat is the TJ Miller, btw, which operates of Staten Island’s Millers Landing. Passing by the Fuller Brush, or Flatiron building if you must, recently – I couldn’t get the whole 23 Skidoo stuff to exit my brain. I went to college a few blocks away at the School of Visual Arts, and Manhattan’s 23rd street was – and remains – one of the main thoroughfares of my life. Post college, most of the advertising agencies which I worked for were located somewhere within a few blocks of the Flatiron for some reason. I seldom photograph along its route, however, as the School of Visual Arts is – as mentioned – just down the block. They have a world class photography program there, and the 23rd street corridor is probably one of the most “captured” spots on the planet. While I was at SVA, I was in the illustration program, so unfortunately I haven’t got much in the way of documentation of the 1980’s version of it as I was drawing comics and painting and stuff back then. It makes me wonder, however. 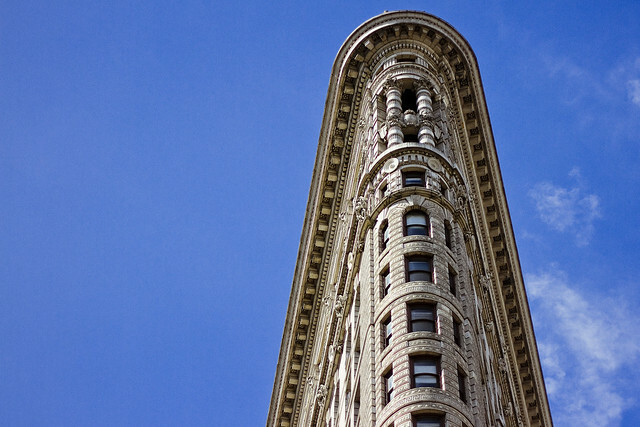 Taking the Flatiron as an example, which is one of the most photographed buildings in NYC, and has been for a century… one ponders what information about our environment could be gleaned from assembling the decades long recordings of its appearance. Weather patterns, erosion, particulate levels in the air? Back in Astoria, after that transformer explosion I described to you a couple of weeks ago, it took the Con Ed guys about three days – working 24 hours, mind you – to put things back in order. 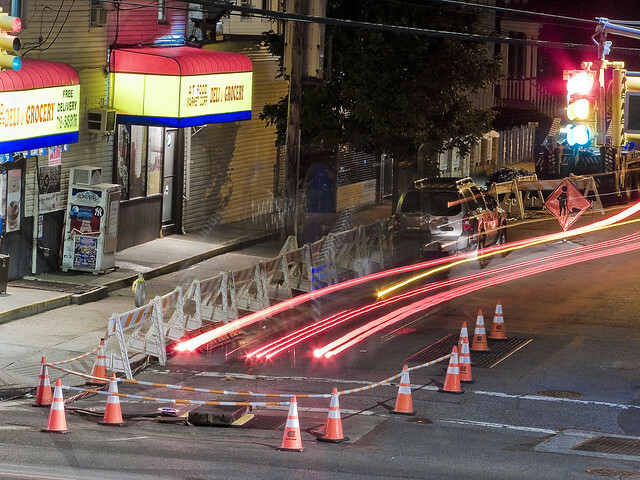 There’s still crews working around two to three blocks north and to south, as presumptively wherever the wires connected to that failed equipment led to must have been also been damaged or affected by the event. That’s my guess anyway. 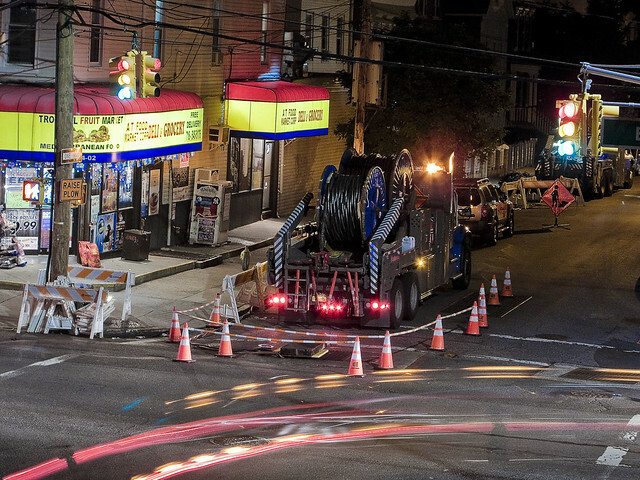 It took the Con Ed crews just under a day to get the blacked out block of 44th street between 34 avenue and Broadway back on the grid, but that’s when their real job began. I don’t know too much about their operation, but I can describe how it played out. First there were emergency crews who arrived in red trucks who “put out the fire.” They were followed by a far larger contingent of blue truck crews who arrived with a variety of equipment and what seemed like a third party contractor. As the project went on, the cable trucks arrived, one of which is in the shots above. The (seemingly) third party contractor got busy digging up a pretty sizable trench leading from the transformer and following the curbline. 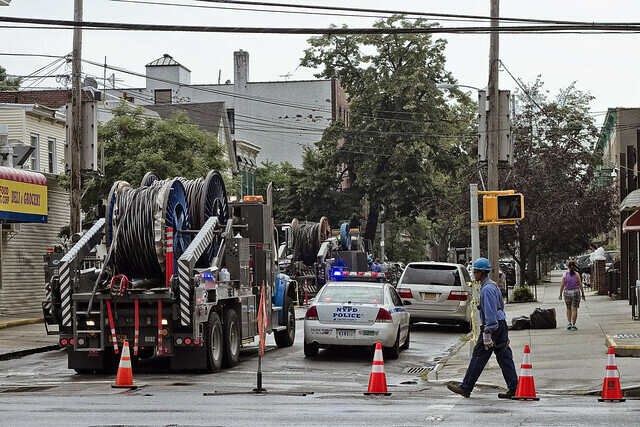 The blue truck guys were moving in and out the manholes and had a substantial amount of equipment deployed. They were all working during the sweltering July heat, incidentally. About three days after the transformer fire, they all suddenly left. Just another blackout in Astoria, Queens, I guess.